You may know that when you submit your resume, it passes an automated Applicant Tracking System (ATS) scan. But that is just the opening skirmish in the battle; you’ve still got to persuade living, breathing hiring professionals that you are the best candidate for the job, and a coherent, polished resume can make recruiters and hiring managers sit up and take notice. Take an objective look at your resume as it looks today. In fact, have a friend or professional acquaintance also review it and provide you with honest, unfiltered feedback. Is it geared to pass the review of a skilled recruiter or hiring professional who may spend as little as six seconds scanning it? With an abundance of resumes hitting their email boxes, HR pros can probably tell at a glance if your digital application materials are worthy of further consideration – or they’re better off just dragging your resume over to that little trash can icon. Format it simply so it is easy to read – no weird fonts, graphics (which can confuse or even cause immediate rejection by an ATS), excess creativity, or information that’s not pertinent to the job. Leave your photo off, but make sure your contact info is easy-to-read. Oh, and make sure your email address is professional and mature; beerguzzler@telco.net or awesomeflirt21@rave.com may not give the recruiter the best and most accurate first impression. Is this job really for you? Do your experience and goals match those described in the job posting? Do you meet the minimum qualifications? Can you honestly commit to the hiring manager’s expectations? Applying for jobs that may not be a good fit may prove a waste of time and energy. Be original! Sure, there are lots of well-worded resumes on the Internet that you can copy, but if you’ve seen it, the recruiter and hiring manager may also have seen it. So rather than try to bend someone else’s words to make it fit your own experience or strength, use your own words. If you get the job, you’ll be expected to come up with original ideas. If your resume shows you are comfortable piggy-backing off others’ thoughts, you may be doing yourself a terrible disservice. Is your resume free of misspellings, inconsistent capitalization and punctuation, and grammatically correct? Regardless of the position you are going for, such attention to detail will be taken into account. Put the most impressive information up front; recruiters and hiring managers may only read the first sentence and/or bullet of your most recent job summaries. For the love of Pete, make sure the address’s name, title and company name are correct! Cut and paste very carefully. 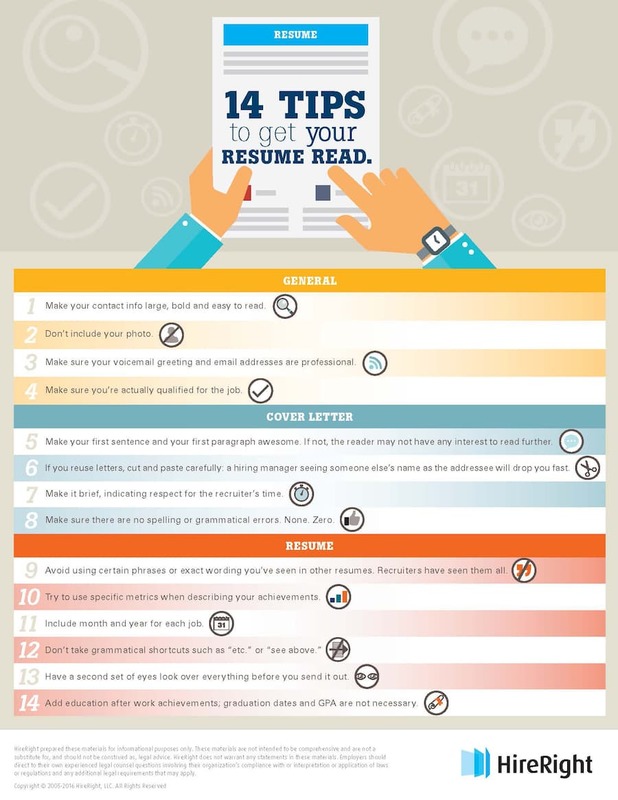 Your resume must be a brief summary of your professional and/or educational experience that succinctly and clearly shows a recruiter you are the best person for the job. Re-read the job description and compare it to your resume. You may even want to create and A/B list, with the job requirements in one column and the elements from your resume that address each requirement in the other column. This exercise may take time but can help you clearly understand whether you – and your resume – present the person worthy of consideration for the job. It will be time well-spent. About Lewis Lustman: I’m a recovering UCLA English major who loves communicating using today’s variety of media. As Content Marketing Manager for HireRight, I have the privilege and opportunity to discover and share new perspectives on the background check process. Top image: Shutterstock.